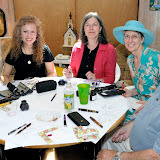 The June meeting of the Baltimore Fountain Pen Society was hosted by founding member Dana Weckesser. From left to right are Teri Lura Bennett, Mel Strohminger and Ms. Weckesser. A photograph of one of Mel Strohminger's custom made fountain pens was featured in an article in a national magazine recently. Members attending the April, 2011, meeting are: (sitting, left to right) Paul Walker, Teri Lura Bennett, Felix Tarasco, Mel Strohminger and Bob Sweeney. Not pictured are Webmaster James Moody, who shot the photo, and Deborah Basel, who arrived after the photo was shot. For addition images, see the Web album below. Teri Lura Bennett, Paul Walker and Dana Weckesser, founding members of the Baltimore Fountain Pen Society, attend the first Baltimore Fountain Pen Show at the Tremont Hotel on March 6. Members attending the December, 2010, meeting are: (sitting, left to right) Teri Lura Bennett, Paul Walker, Bob Sweeney; (standing, left to right) Mel Strohminger, Dana Weckesser, Felix Tarasco and James	Moody. For addition images, see the Web album below. The October meeting of the Baltimore Fountain Pen Society was hosted by member Felix Tarasco at Baltimore's famous Nick's Fish House. Members of the group present for the meeting were, left to right: Bob Sweeney, Mel Strohminger, Dana Weckesser, Felix Tarasco, Deborah Basel and Teri Bennett. Webmaster James	Moody was on the business end of the camera. 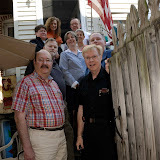 The June, 2010, meeting of the Baltimore Fountain Pen Society was hosted by members Paul Walker and Dale Dusman on June 13. pictured are, left to right, Don Lewns, James Moody, Chris Cooper, Dana Weckesser,	Bob	Sweeney,	Paul	Walker and the Rev. Dale Dusman. Dana Weckesser gratiously hosted the April, 2010, meeting of the Baltimore Fountain Pen Society. Pictured, from top row left, are: Deborah Basel, Paul Walker, Rebecca, Teri Bennett, Mel Sthrominger, Dana Weckesser, Bob Sweeney, Felix Tarasco	and	James	Moody. See the photo album below for more images from the meeting. 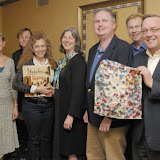 The fall meeting of the Baltimore Fountain Pen Society was held on October 4 and was hosted by Deborah Basel. Pictured in the halloween spirit, from left, are: Deborah Basel (holding club mascot Wendy), Teri Bennett, Mike Meyers, Bob Sweeney, Dana Weckesser	and	James	Moody. 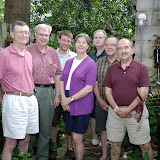 Members of the Baltimore Fountain Pen Society pause to pose in the host's garden during the May 31 meeting. Members are, from left, Deborah Basel, Mike Myers, Dana Weckesser, host Paul Walker, Mel Strohminger, Bob Sweeney and Teri Lura Bennett. The February meeting of the Baltimore Fountain Pen Society was held on the 6th at Orchard Landing Restaurant in Towson. Pictured, left to right, are Dana Weckesser, Teri Lura Bennett and Felix Tarasco. Webmaster James Moody was also present but on the business end of the camera. 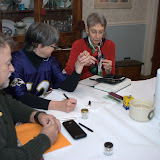 Members of the Baltimore Fountain Pen Society met on November 30 for their regular December meeting. Pictured, left to right, are Deborah Basel, Bob Sweeney, Michael Myers and Teri Lura Bennett, along with new club mascot Everest. Webmaster James Moody shot the photo. 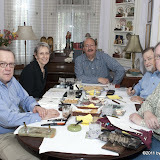 Five members of the Baltimore Fountain Pen Society met on October 6. Pictured, left to right, are Deborah Basel, Bob Sweeney, Teri Lura Bennett and Michael Myers. Not pictured (because he was behind the camera) is Webmaster James Moody Thanks to our hostess, Teri Lura Bennett. Scenes from the June meeting of the Baltimore Fountain Pen Society meeting. Thanks to hosts Paul Walker and Dale Dusman. Several members of the pen society attended this year's Philadelphia Fountain Pen Show, January 25-27 at the Sheraton Center City Hotel. The show was a tremendous success. Be sure to view a gallery of scenes from the show. Dear all Fountain Pen lovers! 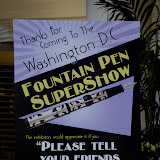 Last weekend (August 10 trough 12) was another great DC Fountain Pen SuperShow. Aren't we lucky to have such an incredible fountain pen gathering opportunity right in our backyard? Many thanks to Bob Johnson, our genial host, who makes it all happen. Friday, August 10 began with a workshop in UNCIAL calligraphy lettering by Ward & Linnea of Atelier Gargoyle, San Francisco. We learned about and practiced this 4th century lettering style from two of the best practitioners of our day. It was an exceptional opportunity & the day flew by, tho’ I did manage to pop into the show to say “hi” to Jim at Bertrams and make a trade with Mike Quitt (a pen for a dear Conklin pen stand adorned with a bronze dog statue). That evening the hotel treated us to a wine & pizza party, a wonderful opportunity to get together with familiar and new pen-folks. A dip in the pool afterwards was a perfect ending to a full day. Saturday, August 11 opened early for us traders & dealers as we scurried about to load tables with wonderful pens & paraphernalia. The atmosphere was electric as we anticipated a busy day. Deborah & I helped Brenda set up her tables for “Paper & Ink Arts,” and then I was off to check with Roger of Penopoly, who had indicated in Philly that he might have a P51 with a broad italic nib for me. He had remembered and we were able to work a deal to both of our satisfactions. After a walk around to catch up with some familiar faces, it was off to lunch. Some of us from the Baltimore Pen club, walked to nearby Bombay Tandoor (no way I was moving my car from the hotel parking lot—they were shuttling folks in!). The luncheon buffet was excellent. After a bit of “pen show and tell,” it was back to the show to score some finds! Bob Sweeney was our SUMGAI, with $5 each for a silver overlay pencil & pen; needs new nib, but worth it! Mike Meyers worked a convoluted deal for a custom Parker Aztec silver pen—beautiful, and only one of Mike’s amazing pen deals! That afternoon our Third Annual Joint meeting of the Mid-Atlantic pen clubs—DC Metro, Baltimore, & Richmond—attracted 20 folks. There were some familiar faces and some new, with more great show & tell. The report from Gerry of the Richmond club was a lesson in business-like club meetings for us DC/Baltimore people. I think we are as organized as we want to be just now, but we were impressed none the less. Several folks brought amazing collections, like Paul's incredible Eversharp collection and we even had a visit from Alain from Detroit, who just wanted to see what pen clubs were about. Several of us made plans to meet in the lobby to caravan to Clyde’s of Tyson’s Corner for dinner. We had a great time, good food & lively conversation. Sunday, August 12 the deal of the day had to be the one Mike brokered for Deb to get a sailor music nib in a yellow pen tweaked by legendary nib-meister Mr. Nagahara. It involved three different vendors to make it happen. I’m impressed & Deborah is delighted with her new pen, which is even better than the one she tried out for her article in Pen World. Doesn't this story sum up why this show is so special, where else could such a deal be done but the DC show? BTW – Northern Virginia is planning major subway construction for next year right in the area around the hotel. There will probably be some new signs and tricky(er?) traffic so, be aware & plan accordingly! Baltimore Pen Society founding member Dana Weckesser hosted the April 2007 meeting at the beautiful and historic Engineer's Club at the historic Garrett Jacobs Mansion in Mt. Vernon on April 1. "There were only four of us at the meeting," member James Moody reports, "but we all had a great time. Dana was the perfect host and we thoroughly enjoyed the lovely surroundings." Pictured above and looking like they fit right into the mansion's beautiful drawing room are the April 2007 quartet: (left to right) club Webmaster James Moody, Dana Weckesser, DC Metro Pen Club and BFPS member Bob Sweeney, and Felix Tarasco. In addition to the usual exchange of pen stories, the group participated in an ink exchange. (Thanks to Bob for the idea.) Each member brought in ink that he or she had either grown tired of or had in too great a supply. After passing the inks around the table, each person was able to take a new ink home. Congratulations to Teri Lura Bennett, who won the night's door prize: a beautiful Omas 1930 pen for which Jim had customized the nib. The prize was also courtesy of Jim from Bertram's. All were surprised that someone other than Paul won for a change; Paul was relieved. And special thanks to Jim, too, for the wonderful gift bags he created for each of us who attended the meeting. You are a great and generous host, Jim! (22:09; 15.2 MB) Afterthoughts, Episode 2: James talks with members of the Baltimore Fountain Pen Society about the club and about the joys of owning and using fountain pens, both vintage and new. Transition music: "Strive" by JavaMusiK. Courtesy of the Podsafe Music Network. Gerry Sandusky, WBAL-TV 11 sports anchor and radio voice of the Ravens, began a love affair with fine writing instruments when fellow anchor Rod Daniels handed him a catalog from Levenger’s. Read more of the article that appeared in the November 28 edition of The Examiner. The summer meeting of the Baltimore Fountain Pen Society was held on April 2 at the Engineer's Club at the historic Garrett Jacobs Mansion in Mt. Vernon. As usual, we passed around our latest pen finds and tried a variety of inks. A couple members brought pads of Rhodia and Clairfontaine papers, so many of us got the opportunity to enjoy using our fountain pens on some great paper. Our next meeting is scheduled for June, and our host of that meeting is trying to schedule a representative from a paper manufacturer or distributor to discuss the attributes of different types of quality paper—and, we hope, how to acquire such paper when not buying in bulk. At the meeting's conclusion, several members toured the mansion. Then we all posed in front of the Washington Monument, which provided our own president with the inspiration for the logo she designed for the society. Thanks to Bertram's Inkwell proprietor Jim Rouse for loaning the giant Sheaffer pen for the photograph. It has become a sort of unofficial mascot for us—and it generated a lot of questions from onlookers in the park. On Friday, February 10, 2006, pen enthusiast and proprietor Jim Rouse hosted a special evening at our favorite pen store,	Bertram’s Inkwell in downtown Baltimore. It was a special treat to be able to visit the store after it was closed. Jim is a special host and we always learn a lot about what's going on in the world of fountain pens. During the meeting, he showed us some of his private collection. And, of course, the rest of us passed around our latest finds, too. Congratulations to member Paul Walker, who won (for the third time!) the great door prize that Bertram's put together for the meeting. We're thinking of delegating Paul the task of purchasing our tickets to the next PowerBall drawing! Call Teri Lura Bennett at 410.488.7531 (h) or 410.955.5411 (w) for additional information.